Tseng Kwong Chi: Performing for the Camera, on view at Northwestern University Block Museum of Art from September 17 to December 11, 2016, is the first major solo museum exhibition of the photographer’s works, which have long sparked the imaginations of younger artists. The exhibition features over 80 photographs including well-known works— such as Tseng’s collaborations with Keith Haring and his East Meets West and Expeditionary series—as well as examples from the artist’s archive that have rarely been shown. An opening celebration will be held on Saturday, October 1st, 2016. Join us for a lunch time walk through the world(s) of Tseng Kwong Chi led by Block Museum Curator for Global and Contemporary Art, Janet Dees. By focusing on a few select works in the exhibition, Tseng Kwong Chi: Performing for the Camera, Dees will highlight some of the important themes running through the artist’s witty work. This lavishly illustrated 178-page monograph features 35 color and 95 duotone images and includes four essays exploring Tseng’s brief but prolific career and his multifaceted oeuvre. Reproducing more than 100 works by Tseng from the late 1970s to the late 1980s—and including archival materials and images from his commissions for the Soho Weekly News—the book represents in depth Tseng’s best-known self-portrait series, East Meets West as well as also features less familiar bodies of work such as the Moral Majority series. 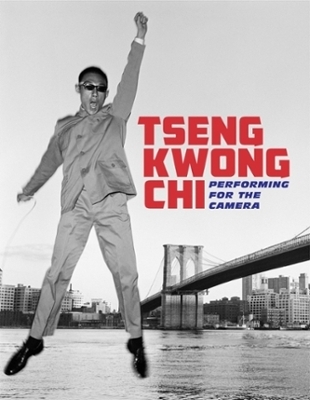 Published to accompany Tseng Kwong Chi’s first major retrospective—organized by the Chrysler Museum, Norfolk, Virginia, and the Grey Art Gallery at New York University—the book includes contributions by Amy Brandt, PhD, McKinnon Curator of Modern and Contemporary Art, Chrysler Museum of Art; Lynn Gumpert, Director, Grey Art Gallery, New York University; Alexandra Chang, Curator of Special Projects and Director of Global Arts Programs, Asian/Pacific/American Institute, New York University; Joshua Takano Chambers-Letson, Assistant Professor of Performance Studies, Northwestern University; and the artist’s sister, choreographer and dancer Muna Tseng, director of the Tseng Kwong Chi Estate. The book also features a comprehensive exhibition history and bibliography.